Mr Robinson, Headmaster of Lurgan College, was thrilled at yet another set of very pleasing performances by his talented Year 12 pupils in their GCSE examinations. With almost every pupil in the year group achieving the top grades of A*-C in at least 5 subjects, this is another remarkable year of academic success at the 14-19 selective grammar school. The 100% pass rate meant that, once again, not a single fail grade was recorded in any of the numerous subjects offered at GCSE level. Carrying on the College Walk school’s proud tradition of academic excellence, 4 extremely gifted pupils managed to secure 11 A*/A grades each. Such is the academic ability of pupils who commit year on year to the very successful Dickson Plan system of education with its unique system of academic selection at age 14. Reflecting the remarkable results at A Level and AS Level last week, the 2018 cohort of Year 12 pupils has produced some outstanding performances at GCSE level. I commend and congratulate our diligent pupils, their highly committed teachers and their very supportive parents on these commendable examination performances. Once again I am keen to share our pupils’ success with our dedicated colleagues in Lurgan Junior High School and in our local feeder primary schools who furnish year on year our 14-19 selective Grammar School with able, mature and conscientious pupils of the highest academic calibre. A more in-depth analysis of the grades secured by the 113 Year 12 pupils in their GCSE examinations reveals an extremely impressive set of results by any standards. Grades A* to B accounted for just under three quarters of the total grades achieved while the A*-C pass rate was much higher than the NI average of just 81%. The encouraging number of A* grades (over 12% in total), sitting well above the NI average, is also very gratifying. Top GCSE grades were recorded in all of the different subject areas but the results in Art and Design (where all the pupils achieved A* / A grades for a 17th successive year!) are surely once again worthy of special mention. The following subjects all scored over 90% at grades A*-C: Art & Design, Biology, Business Studies, Computer Studies, English Language, English Literature, Food & Nutrition, Further Mathematics, Geography, Health & Social Care, History, ICT, Learning for Life and Work, Mathematics, Music, Physics, Religious Studies, Russian and Sports Studies (PE). 4 pupils managed to secure an amazing 11 straight A*/A grades each. Worthy of particular acclaim is former King’s PS pupil, Andrew Combe, who amassed a breath-taking 11 straight full-course A* grades! This is a truly remarkable achievement by any standards on the part of this extremely able young man and one which will not be bettered in many other grammar schools in the province. The following pupils were awarded 11 straight A*/A grades: Micah Carson (Carrick PS), Andrew Combe (King’s Park PS), Katie O’Connor (Ashley Hill PS) and Lauren Tolmie (King’s Park PS). The following pupils secured 10 straight A*/A grades: Hannah Burke (Derryhale PS), Laura Butler (King’s Park PS), Lewis Fryers (King’s Park PS), Patrick Lappin (Waringstown PS), Scott Morrow (King’s Park PS), Juste Savickyte (King’s Park PS) and Ellie Wilson (King’s Park PS). Leah Gorman (Carrick PS), Kaitlyn Pringle (Tandragee PS) and Emma Wilson (King’s Park PS) all recorded 9 A*/A grades. The following pupils achieved 8 A*/A grades: Lucy Clarke (Maralin PS), Luke Currie (Waringstown PS), Marlena Jagoda (St Francis’ PS), Anna Long (Maralin PS), Courtney Martin (King’s Park PS), Matthew Martin (Dickson PS), Rachel Park (Ballinderry PS) and Anna Smyth (Clare PS). Rachel Black (Donaghcloney PS), Olivia Gibson (King’s Park PS), Emma Giraudeau (Ballycarrickmaddy PS), Ryan Holmes (King’s Park PS) and Anna McNeill (Moira PS) all secured a commendable 7 A*/A grades. The now annual late release of the results coming so near the start of the new term has once again put a high degree of strain on the system. The College Careers staff have been extremely busy advising and guiding pupils as they finalise their choices for next year with the vast majority returning to study four AS Levels in the ever-growing Sixth Form of Lurgan College. Next year’s Y13 pupils will continue to enjoy a broad mix of academic and vocational subjects, which will exceed the Department of Education’s statutory Entitlement Framework. These results reflect, once again, the outstanding success of our deeply cherished Dickson Plan with its unique system of delayed academic transfer at age 14. This irrefutable evidence of the effectiveness of the popular Craigavon Two Tier System should surely inspire us all within the system in general and in the Lurgan community in particular to protect and enhance our well tried and tested Dickson Plan in the years ahead. 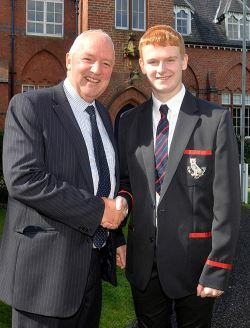 Congratulations to Andrew Combe on gaining 11 A*s in his GCSES. What an achievement!